The Gemara in Pesachim (102a-b), amidst a lengthy discussion of the various laws of Kiddush and Berachos, quotes the following Beraissa: Our Rabbis taught, members of a group who were reclining and Shabbos began while they were still involved in their meal — Rebi Yehudah says, we bring a cup of wine and say Kiddush over it. Rebi Yosi says, the group may continue eating after dark. When they finish, they should say Birchas HaMazon on one cup of wine, and then Kedushas HaYom on another. 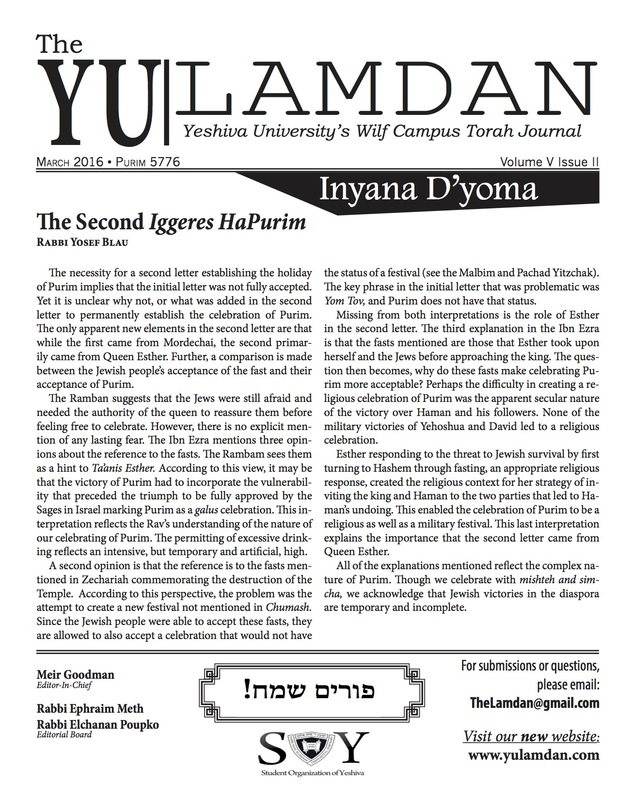 The Gemara asks, why is it necessary to make Birchas HaMazon and Kiddush on two separate cups of wine? Let the mevareich say both on one! Rav Sheishes cryptically responds, because we do not say two kedushos on one cup. The Gemara asks, what is the reason, to which Rav Nachman responds: ein osin mitzvos chavilos chavilos — we do not make miztvos into bundles. The Gemara in Sotah (8a) quotes a beraissa as the source for this principle: We don’t make two Sotos drink the mei sotah at once; we don’t purify two metzora’im at once; we don’t pierce the ears of two avadim at once; nor do do we break the neck of two calves at once, since we don’t make mitzvos chavilos chavilos. Rashi and the Rashbam in each respective Gemara explain that the problem with making miztvos into “bundles” is that it appears as though the miztvos are burdensome to the performer. By “killing two birds with one stone,” as it were, and making two sotos drink from the same cup of mei sotah, or reciting both Birchas HaMazon and Kiddush on one cup of wine, one makes it seem as though the performance of these mitzvos are so burdensome to him that he will not expend the extra effort to prepare a second cup of wine or mei sotah. The Gemara in Pesachim continues to ask on the premise that we do not make two kedushos on one cup of wine by quoting statements from Abaye and Rava. When Yom Tov Rishon falls out on Motzoai Shabbos, Abaye holds that the correct order of the berachos said during Kiddush HaYom is yayin, Kiddush, zman, neir, Havdalah; whereas Rava holds the correct order is yayin, Kiddush, neir, Havdalah, zman. Despite their disagreement, both Abaye and Rava agree that we recite Havdalah and Kiddush over one cup of wine. Why is this not a problem of saying two kedushos? The Gemara answers that Havdalah and Kiddush are basically one inyan — both profess to kedushas hayom, and the Havdalah itself makes mention of kedushas Yom Tov with the phrase hamavdil bein kodesh l’kodesh (see Rashi and Rashbam). The conclusion of the Gemara in Pesachim yields an important limitation on the problem of ein osin mitzvos chavilos chavilos. Generally, two separate miztvos cannot be performed simultaneously over one cup of wine, or any other cheftza. The beraissa in Sotah, the source for this prohibition, teaches that ein osin mitzvos chavilos chavilos is problematic even when the two mitzvos being performed are the same mitzvah. Since they are nonetheless distinct insofar as they are two separate fulfillments of said mitzvah, whether it be making a sotah drink mei sotah or piercing the ear of an eved who wishes to stay on with his master, they cannot be “bundled” together. However, Havdalah and Kiddush, despite being separate obligations, may be recited together, as they are connected. It is interesting that the intrinsic connection between Havdalah and Kiddush is sufficient to alleviate the issue of chavilos, whereas multiples of the same mitzvah, despite their complete similarity, does not. In light of Rashi and the Rashbam’s understand of the issue at hand, this distinction can be easily explained. Two separate performances of the same mitzvah are still two separate actions, irrespective of the fact that they are the same action, and simultaneously performing them may arouse the suspicion of onlookers who see this “bundling” as indicative that the performer considers their performance to be burdensome. Reciting Havdalah and Kiddush one the same cup of wine, however, cannot be seen as burdensome, as their intrinsic connection makes it logical that they should be performed together, and thus does not incite suspicion. Later in Arvei Pesachim, Tosafos (115a s.v. v’hadar achil chasa belo beracha) quotes an opinion which, in light of the above discussion, is significantly problematic. The Mishna (114a) teaches that at the beginning of the Seder, a vegetable is taken and dipped — what it is dipped into is the subject of a machlokes Rishonim. The Gemara (114b) states that karpas, as this step in the Seder is colloquially called, is intended to serve as a hekeirah, an anomaly that piques the interest of the children at the table and causes them to question and take heed to the events of the night. The Gemara then quotes a dispute between Rav Huna and Rav Chisda regarding when the beracha of al achilas maror should be said if one uses a vegetable suitable for maror, such as lettuce, for karpas. Rav Huna says, one should first make a borei pri hadamah on the maror being used for the hekeirah, and later say al achilas maror on the maror being used to fulfill the actual mitzvah. Rav Chisdah, on the other hand, holds that both al achilas maror and borei pri hadamah should be made on the maror for hekeirah, and no beracha should be made on the maror for the mitzvah. Both Rav Chisdah and Rav Huna indicate that no additional borei pri hadamah needs to be said over the maror shel mitzvah. Tosafos explains that this is because the maror is considered to be amongst the food items that are ba’im besoch haseudah and whose berachos are exempted by hamotzi. Thus, the hamotzi made on the matzah prior to the eating of the maror exempts the recitation of a borei pri hadamah. Tosafos quotes a dissenting opinion from Rav Yosef Tuv Elem, who implies that the hamotzi does not exempt the maror. Rav Yosef Tuv Elem says, “Why do other vegetables come at the beginning of the seudah? In order to exempt the chazeres (maror) from its appropriate beracha.” Rav Yosef Tuv Elem seems to be saying the Chazal instituted karpas in order to make a borei pri hadamah for the maror. This claim is highly problematic; if the maror’s beracha is not exempted by the hamotzi, why can’t the borei pri hadamah be said on the maror itself? Why necessitate another achilah earlier on in the Seder? Further, Tosafos himself asks, how could Rav Yosef Tuv Elem say that the purpose of karpas is to exempt the maror when the Gemara clearly says that it exists to serve as a hekeirah? Tosafos’ next two questions shed considerable light on Rav Yosef Tuv Elem’s intent. Tosafos first asks, “and further, ein osin mitzvos chavilos chavilos does not apply here.” Tosafos’ sudden introduction of the concept ein osin mitzvos chavilos chavilos suggests that Rav Yosef Tuv Elem thinks that it is necessary to make a separate borei pri hadamah on the karpas precisely because chavilos prevents making both a borei pri hadamah and an al achilas maror on one piece of vegetable. To this Tosafos asks, what does this have to do with chavilos? These two berachos are not separate mitzvos; in order to eat the maror, one needs to make the appropriate birchas hanehenin. They are intrinsically linked, and surely would not incite an onlooker to suspect that the performer feels that these mitzvos are burdensome in any way! To buttress his claim that birchos hanehenin do not pose an issue of chavilos, Tosafos points to Rav Chisda himself, who clearly permits making both berachos on the first achilah! Tosafos in Berachos (39b s.v. hakol modim) uses the same sevara as Rav Yosef Tuv Elem to justify another practice at the Seder. The Gemara says that one of the pieces of matzah needs to be perusah in order to fulfill the implication of lechem ani — poor man’s bread. Tosafos writes that the broken piece of matzah should be placed under the complete piece, and the mevareich should make hamotzi on the complete piece and al achilas matzah on the broken piece. One should not, however, make both berachos on the broken matzah as the would be a problem of ein osin mitzvos chavilos chavilos. Tosafos interjects and says that this doesn’t make sense: birchos hanehenin do not pose an issue of chavilos. Tosafos brings proof from Kiddush, where birchas Kiddush and borei pri hagafen are said simultaneously on one cup! The totality of Tosafos’ questions on both Rav Yosef Tuv Elem and the opinion cited in Tosafos in Berachos clearly point in one direction. Normally, birchos hanehenin do not pose a problem of chavilos, as evidenced by Rav Chisdah and Kiddush. However, a small diyuk in Tosafos in Berachos reveals that sometimes the issue applies outside of the norm. Tosafos writes that one should not make two berachos on the broken matzah because it is “like making mitzvos chavilos.” Tosafos’ language suggests that the issue here is not precisely an issue of chavilos, but runs close to it. (This phraseology stands in contrast to other cases where the Gemara and Rishonim simply state that the situation is osin mitzvos chavilos, and do not add the modifier “like.”) I think the intent of Rav Yosef Tuv Elem and Tosafos in Berachos is as follows: While it is true that chavilos does not necessarily pose an issue when it comes to birchos hanehenin, nonetheless, in situations when it is convenient to arrange the miztvos in a fashion where even a semblance of chavilos is abrogated, it is preferable. Thus, when you have two matzos in front of you, since it is possible to separate the two berachos on each piece of matzah, one should. Likewise, since Chazal already instituted karpas to serve as an hekeirah, we might as well use its borei pri hadamah to exempt the maror. The general principle that emerges is that while these situations are not real issues of chavilos, since they are like making mitzvos chavilos, it is preferable to separate the two berachos when convenient. It is hard to imagine, however, that our current conception of the reason behind the issue of ein osin mitzvos chavilos chavilos works alongside Rav Yosef Tuv Elem and Tosafos in Berachos. If the problem is that “killing two birds with one stone” looks as if one finds the mitzvos to be burdensome, birchos hanehenin certainly do not create such an issue. It is clear to any onlooker that the beracha is being said in order to facilitate the performance of the mitzvah of achilas matzah or achilas maror. How could be say that semblance of chavilos warrants a separation of the berachos when convenient if there is simply no semblance of the issue in the first place? It seems, then, that these two approaches argue in the very reason why ein osin mitzvos chavilos chavilos. If Tosafos understands like Rashi and the Rashbam cited above, we can understand the full thrust of his difficulties. There is simply no sevara within such a framework that would justify extra hakpadah for chavilos outside the normative situations discussed by the Gemara. On the other hand, Tosafos in Moed Katan (8b s.v. lefi she’ein) suggests a different explanation. Tosafos contends that the principle ein marvin simcha b’simcha is similar to the reason why we don’t make mitzvos chavilos: it is necessary for the performer of the mitzvah to focus his full attention on it. Whereas Rashi and the Rashbam see the issue as one of appearances, Tosafos sees it as a basic tool to ensure that each mitzvah is accorded proper concentration. Simultaneous performance of two mitzvos confuses the performer and makes it more difficult to focus on each separate obligation. By bifurcating their performances and demanding, for example, two cups of wine for Kiddush and Havdalah, the individual is able to focus better on each action. If Rav Yosef Tuv Elem and Tosafos in Berachos subscribe to this approach, and ein osin mitzvos chavilos chavilos is primarily an issue of kavanah, then we can understand how even birchos hanehenin can pose an issue. Despite the fact that birchos hanehenin are necessary in order to perform the actual obligation, separating the two berachos and relegating each to a different cheftza helps the performer focus more fully on each duty: that of achilas maror or matzah, and that of reciting a birchas hanehenin. It is not a real issue of ein osin mitzvos chavilos chavilos because the two berachos are not inherently distinct. Nonetheless, if convenient, Rav Yosef Tuv Elem and Tosafos in Berachos suggest hakpadah for chavilos can benefit the mevareich’s overall concentration and intent.